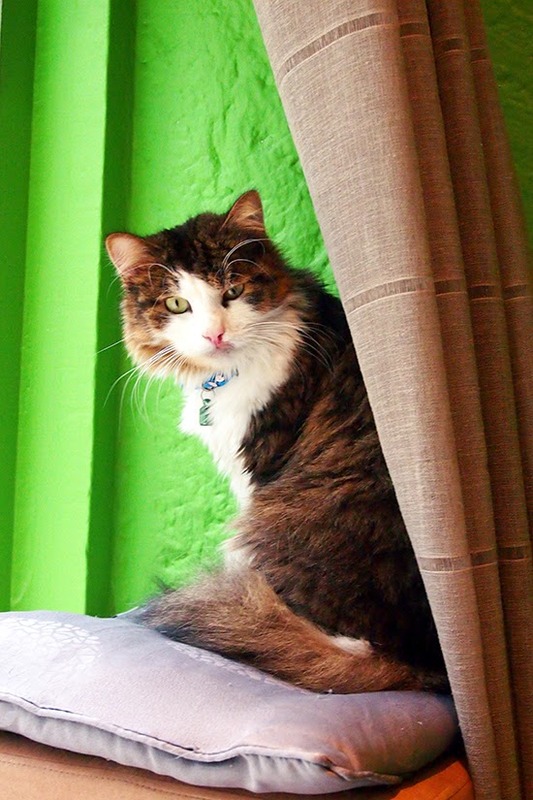 Belgium has just opened its first cat café: Le Chat Touille. 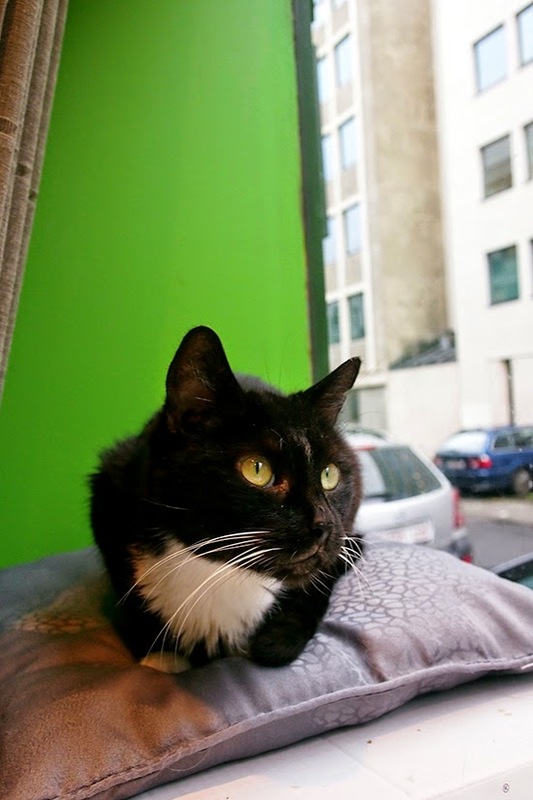 Located in Saint-Gilles (part of Brussels), Le Chat Touille is home to five cats that were all adopted from the local shelter WAHF. Everyone can come in for free to cuddle the cats and eat/drink something in their company. It is open from Tuesdays to Sundays from 12 pm to 8 pm. I visited Le Chat Touille on Tuesday and spent the entire afternoon with their cats Fripouille, Noël, Coca, Simba, and Chiquita. 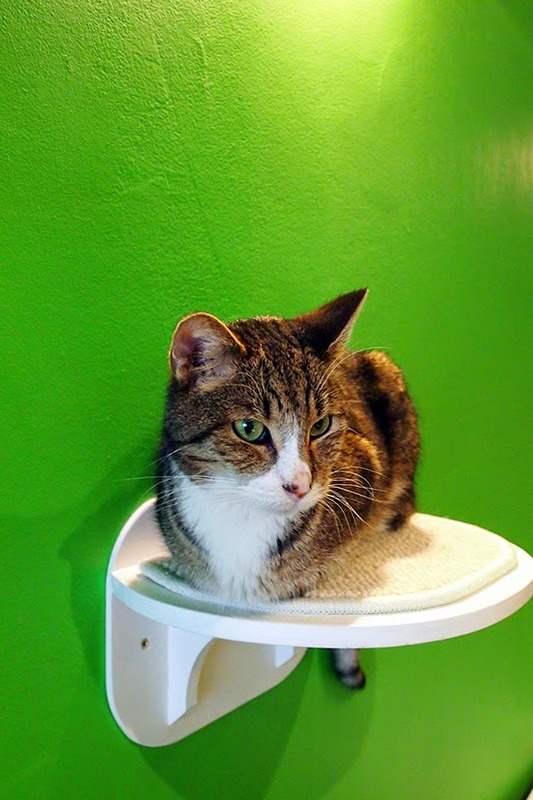 They are all very relaxed and are definitely enjoying their new life in this tiny green cat café. As Le Chat Touille is only a ten-minute-drive from where I live, I will certainly come back here to dine with a friend or to write. 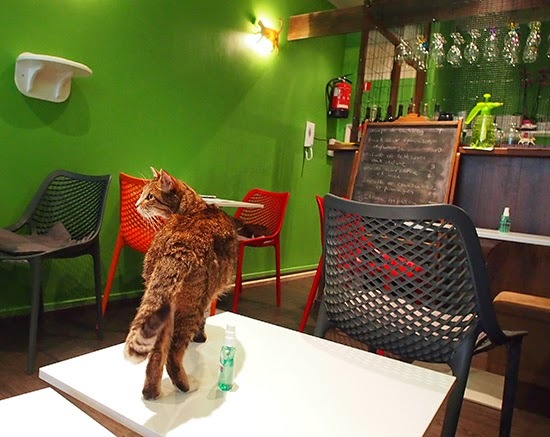 Have you ever been to the cat café Le Chat Touille? PS. Have you seen our pictures of the Black Cat Café in Japan? OMC Yous changed evewyfin'. It looks gweat. Da kitties all look gawjus. 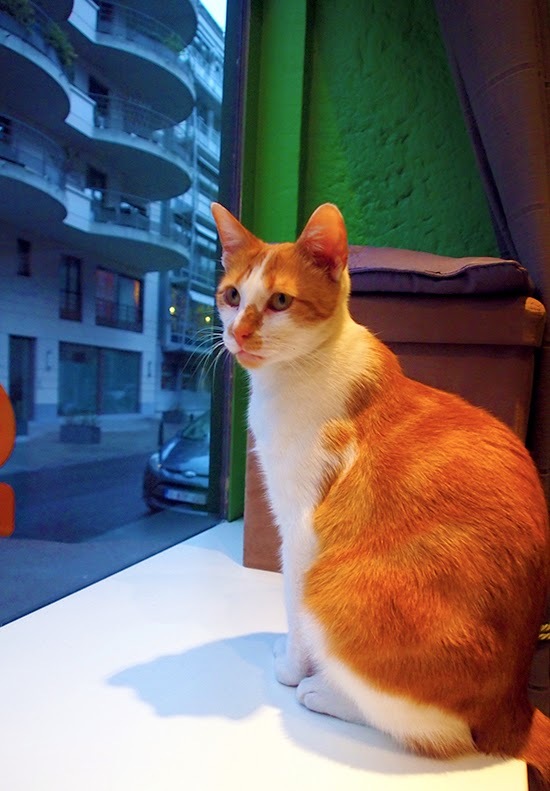 There are cat cafes in Belgium? I didn't know that. I've not been to a cat cafe myself but I've always enjoyed the idea. It made more sense in Japan though as houses there are small and a lot of people don't have room for cats. I've been to bookstores loaded with cats, but not to a cafe. How wonderful, the cats look happy. These cafes are popping up more and more! How I wish we had a cat café here in Edmonton! I'd be there every day! What a cool idea! I had no idea there were cat cafes. The kitties all look very happy in your pictures, I'm sure they enjoy getting lots of attention. That is fantastic! Kitties sure look like enjoying living there. I've never been to cat cafe, but would love to visit some day. 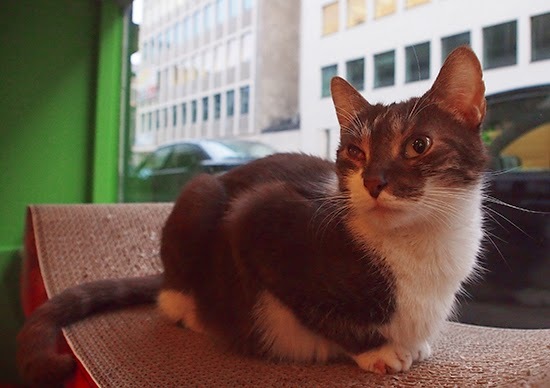 Wonderful photography of the beautiful cats in their very own cafe ~ Delightful! You're so lucky! Your pictures are great of these lovely kitties. I'm so glad they're all rescues. I think ones in both NYC and Paris have recently opened. I hope to visit both! p. s. I love your logo! They’re opening a cat cafe in NYC next month. Yay! Hope the walls are such a pretty green. These cat cafés seem to be all the rage in world class cities. I think it would be a hoot to experience this! I think the cat cafes are becoming the new chic. Schitterende foto's van deze al even schitterende katten, maar die eerste springt er voor mij beslist uit, een topper hoor! Fijn weekend Vanessa, geniet er van hé! That's so cool! A cat cafe is a wonderful idea. I hope one opens near us! I've didn't realize that cat cafes were real things! Haha, that's so awesome! Love the contrast of the green wall. Beautiful! Ils ont effectivement l'air satisfaits ces chats. Je ne sais pas exactement pourquoi mais c'est une idée qui au fond de moi me laisse une impression de malaise. A Nice il y a un bar à chat qui vient d'ouvrir. Il s'appelle le Nice Cat's Café. Je n'y suis pas allée, mais la moitié des chats sont à l'adoption. C'est peut être une bonne idée dans ce cas. lovely, lovely photos and I adore the green background! ooooh, SO envious. WE wanna cat cafe over here!! Looks pawesome! How sweet! 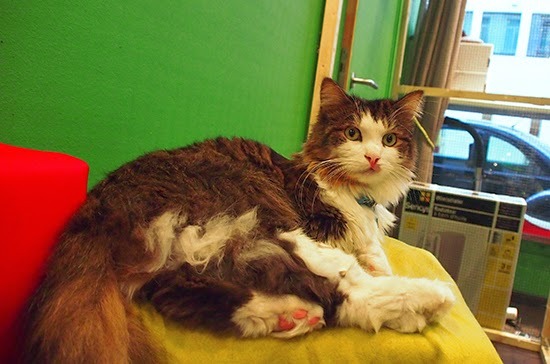 I have never been to a cat cafe...but when I lived in NYC, there were lots of cafes that had a resident cat. 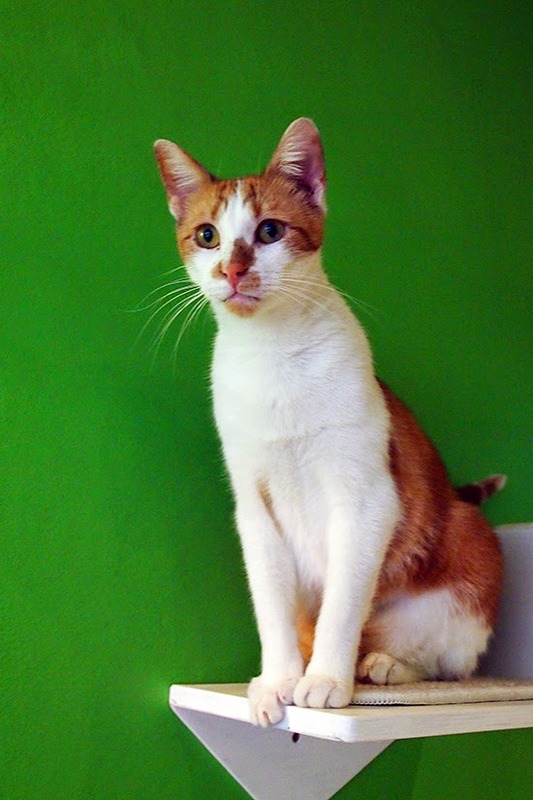 You make beautifull pictures, I am sure those cats understand you very well . I have two cats but if I want to make picture they start moving or running, it seems they do not want to understand me. Thanks for sharing the story and pictures. Cat cafe? How cool is that??! Je ne connais pas de café des chats, mais je sais qu'il y en a un à Paris qui s'est ouvert récemment il me semble. I want to go to the cat cafe!!! This is so wonderful! That is so cool, love this post and the pics of the kitties!